Posted Oct 12, 2017 by Eds. Donald Trump is by no means the first US businessman to flirt with the far-right and even fascism. In the 1920s and 1930s many American businessmen looked to fascism as a way to protect their interests. One particular individual stands out though — Henry Ford. Ford is still celebrated as one of the greatest US businessmen, as someone who transformed modern capitalism. What is less often acknowledged is that he was also a vicious antisemite. Indeed, far from Ford being influenced by the Nazis, it was very much the other way round. Ford had his own newspaper, the Dearborn Independent, that was distributed throughout the country and at its height had a circulation of half a million copies. In May 1920 it carried the first of a series of antisemitic articles on “The International Jew”. Over succeeding weeks and months readers were treated to such exposés as the “fact” that Abraham Lincoln had been assassinated by Jewish bankers; that jazz had been invented by the Jews to demoralise the American people; that Jewish doctors were inoculating white people with syphilis, and much more. Ford was a staunch believer in the validity of the Tsarist forgery, the Protocols of the Elders of Zion. As far as he was concerned, there was an international Jewish conspiracy to dominate the world and he was warning the American people about it. And not just the American people. The “International Jew” articles were published in book form with the same title and the book went on to become one of the most influential antisemitic works of the 20th century. In the course of the 1920s it was translated into 16 languages. In Germany the book became one of the mainstays of Nazi propaganda, going through an incredible six editions by the end of 1922. When Adolf Hitler was interviewed by the Chicago Tribune in March 1923, he went out of his way to sing the praises of “Heinrich Ford” and his “anti-Jewish articles”, describing him as the leader of US Fascism. Indeed, Hitler had a picture of the Ford automobile on his office wall. Ford was forced to retreat from his public championing of antisemitism in 1927, but he refused to repudiate The International Jew, which remained in print in many countries. He employed Fritz Kuhn, the leader of the pro-Nazi German-American Bund and covertly financed the activities of the American fascist and antisemite, Gerald Smith. As far as Ford was concerned, Franklin Roosevelt was part-Jewish, and he was convinced that the US trade union movement was the work of Jewish bankers out to destroy American industry. The New Deal was the “Jew Deal”. Inevitably, the Second World War was also the work of the Jews, according to Ford. When a pro-Nazi gathering of US businessmen met to celebrate the German victory over France in June 1940, Ford sent his son, Edsel, to represent him. And the Führer was grateful. 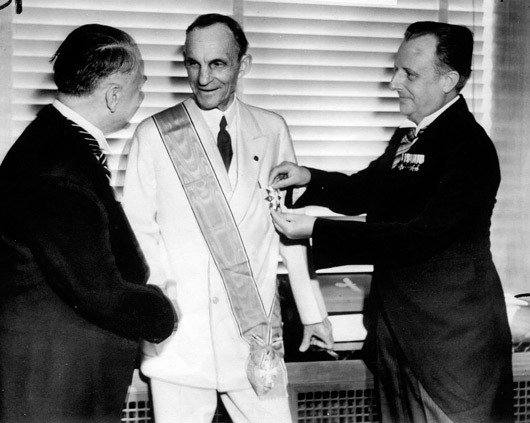 On 30 July 1938 Hitler sent Ford congratulations on his 75th birthday and awarded him the Grand Cross of the Supreme Order of the German Eagle, an honour he shared with the likes of Hungarian dictator Admiral Horthy, General Franco of Spain and Benito Mussolini of Italy. As far as domestic fascism in the US was concerned, however, in the 1930s it never managed to become a mass movement. It was still of use to US businessmen though, doing some of the dirty work that they could not get done by other means. One particularly murderous fascist organisation was the Black Legion, an off-shoot of the Ku Klux Klan, that was used by the Detroit car companies in their fight against the unions. Many of the foremen in General Motors car plants were Black Legion members and they dominated a number of police departments across Michigan and Ohio. The Black Legion was held responsible by the left for at least 30 murders of union activists, socialists and black people in Michigan between 1933 and 1936. The Black Legion’s chosen uniform was Ku Klux Klan robes died black, but for some reason they replaced the Ku Klux Klan headgear with a pirate hat! They never became a mass movement, but were nevertheless a dangerous fascist terrorist organisation. Hitler’s Nazis had successfully destroyed the German labour movement in the early 1930s, but in the US this period brought a great explosion of trade union militancy. Beginning in 1934 with huge strikes in Minneapolis, Toledo and San Francisco, the movement reached a climax in the great wave of factory occupations that began at General Motors in December 1936. This collective working class militancy shifted the balance of class forces across American society, pushing the Nazis and antisemites onto the back foot.